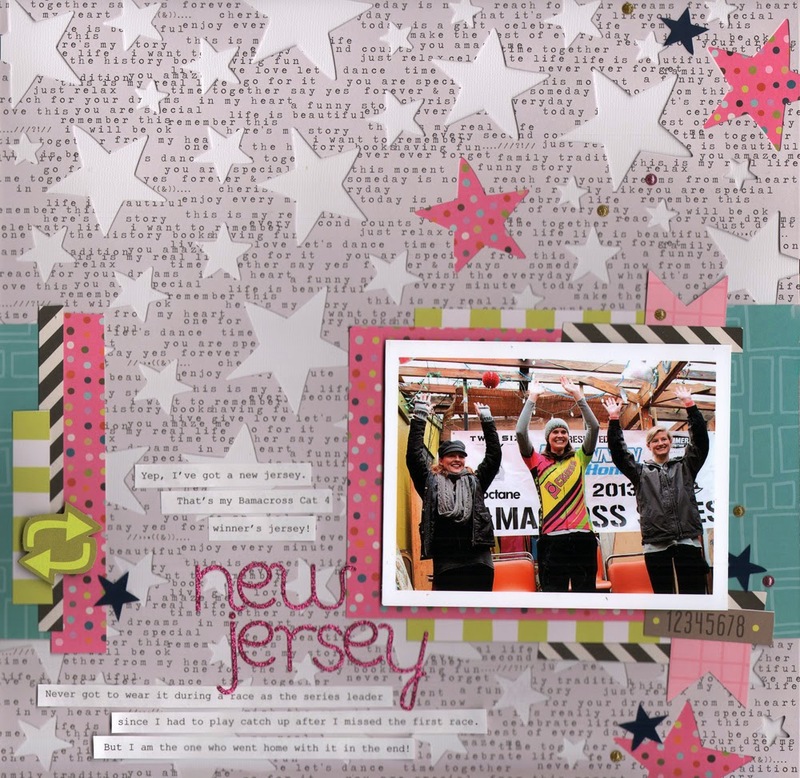 Today we have a layout created by design team member, Gretchen McElveen, showcasing the new KI Memories - Playlist. 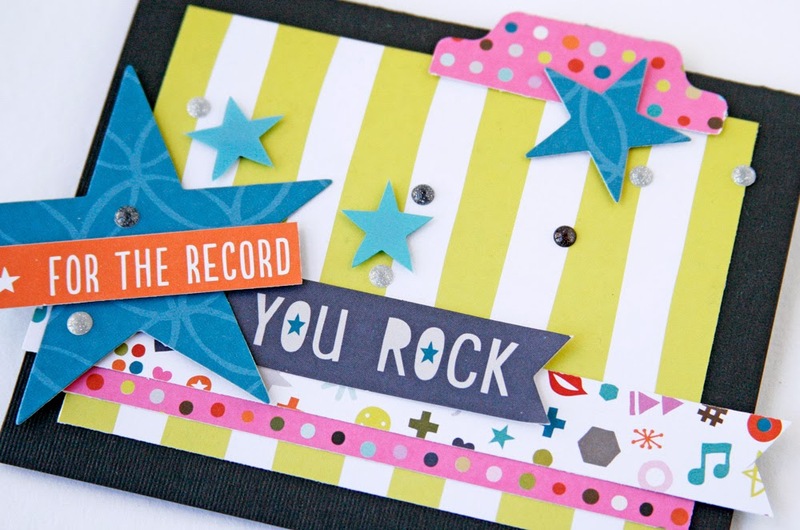 I love the star die-cut paper that Gretchen used on her layout. 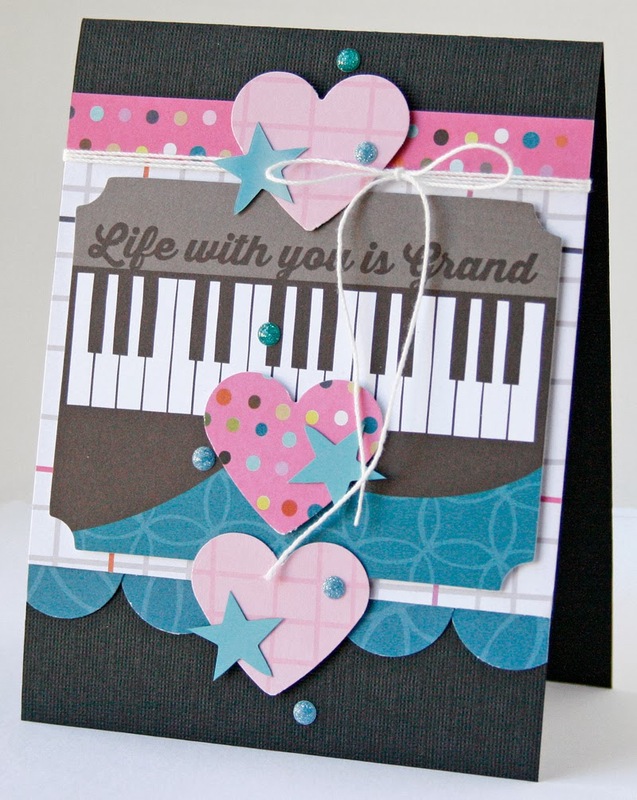 Today's cards, by design team member Gretchen McElveen, use the new KI Memories Playlist line: pattern papers, die-cuts and stickers. Check them out! Let’s face it we all have friends that know too much about us, all the more reason to keep them close right? Here is what looks like an everyday shabby chic card until you read the sentiment. 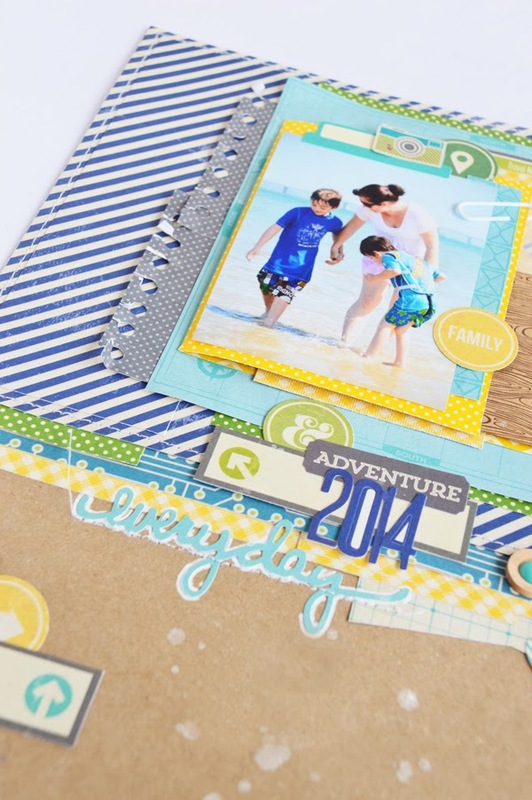 It was put together using KI Memories 6x6 Pad and the LOL Hampton Art stamp set. 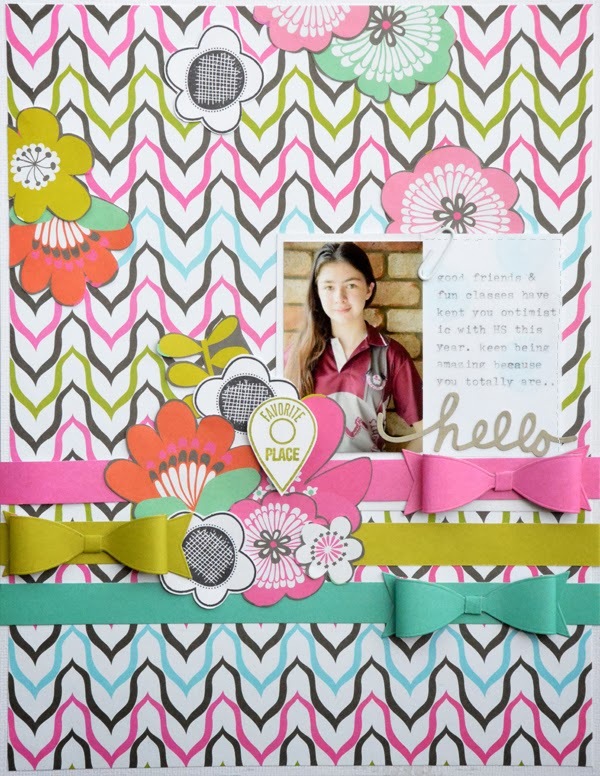 Start with a cream color card base and add the center panel mat leaving the border edge. Then using a coordinating paper add the center strip panel after distressing the edges. 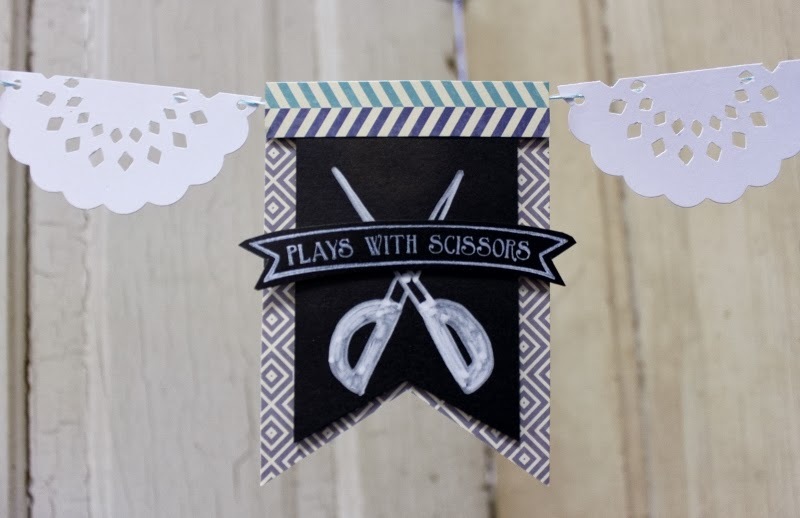 Then add a plain cardstock color center stripe with distressed edges, on top of it add a banner piece of patterned paper in a contrast color also with distressed edges. 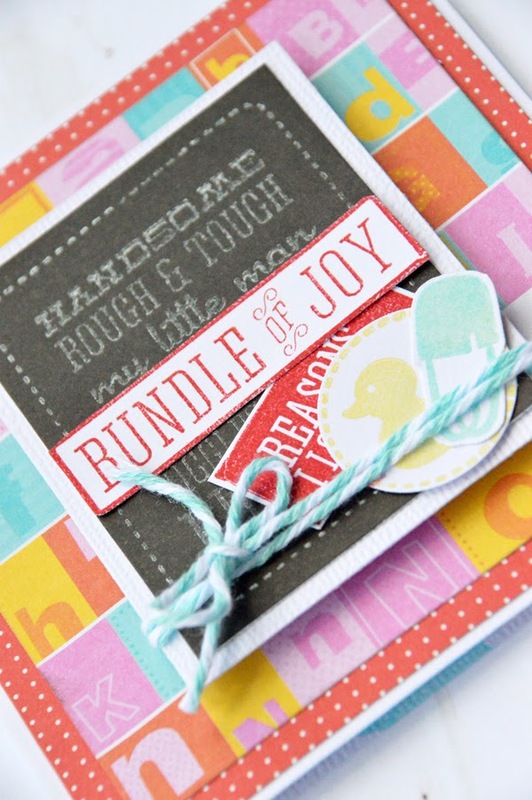 Using a scalloped circle punch, punch out five scalloped circles in coordinating papers. Spray the circles lightly with water and crumple up, then flatten out and allow to dry. Once dry layer them together and insert a brad through the center of all of them and flatten the back to hold flower together. Manipulate layers by crumpling and folding to achieve the 3D flower look and then a flower center to cover the brad. Next stamp the sentiment from the LOL stamp set onto plain cardstock cocoa color in brown ink, fussy cut it out and attach 3D foam dots to each end allowing center to arch up to add dimension. How many friends do you have that are this close? Better make a card for each of them, which might keep them quiet. 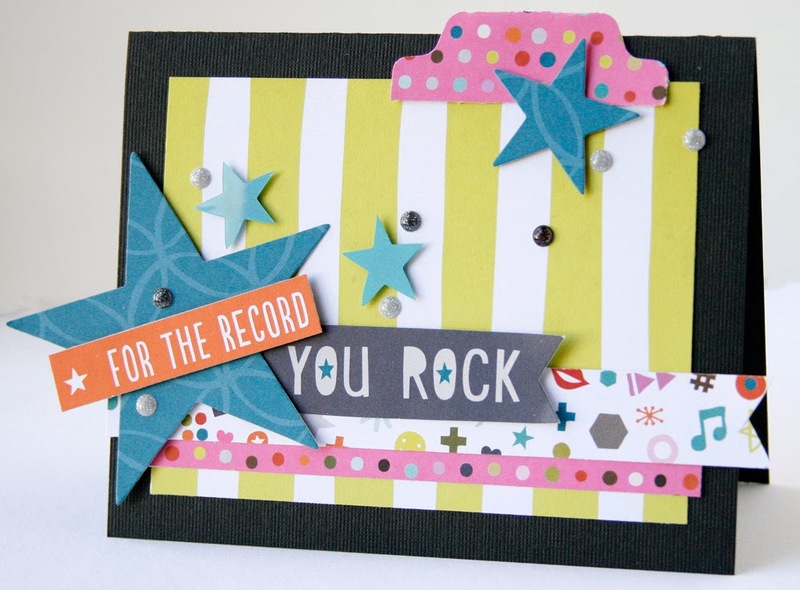 Looking for a card to share in a friend’s recent success? 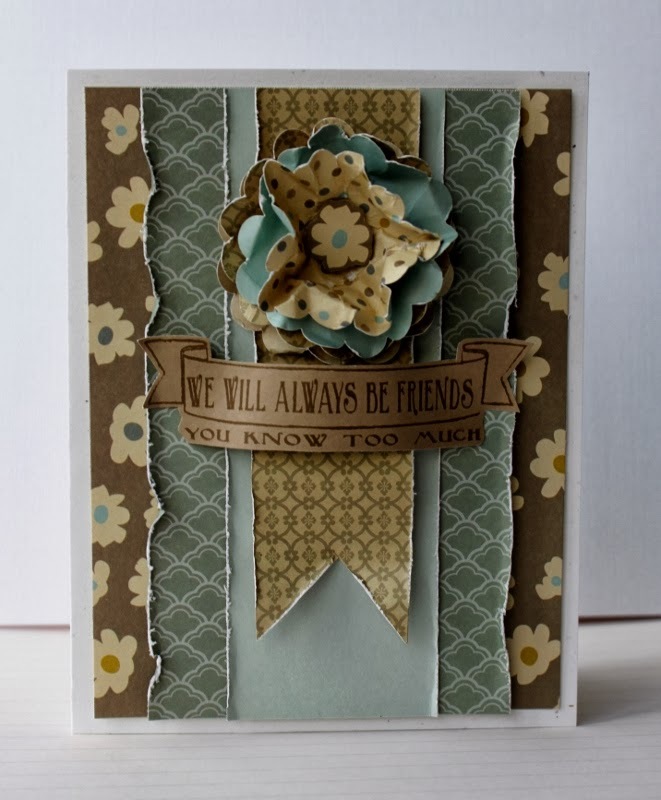 Here is one designed in a fun hexagon shape using KI Memories Peace and Butterflies 6x6 Pad and the new Jillibean Soup/Handwritten Sentiments stamp set. 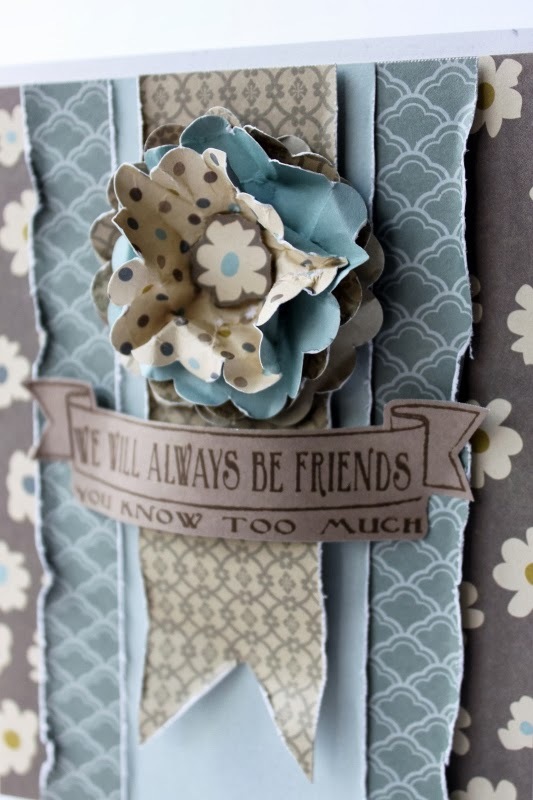 This card begins with a white cardstock base and then the floral center panel was added from the KI Memories Peace and Butterflies paper pad. Next the border strips were cut from the coordinating purple cardstock sheet from the pad and border punched and attached to card base as shown. Next select a wood butterfly from the Stampables large assorted wood shapes and stamp with the Chilled Cucumber flower stamp from small set #2 in purple ink. Next select 3 coordinating patterned papers and cut out 2 triangles from each. Assemble the triangles as shown to create your hexagon, using foam dots to pop up every other triangle. Then from the Cold Avocado Soup flashcard pack pull out the “happy” flashcard and trim down and using corner rounder round the two bottom corners. Attach flashcard to hexagon as shown. 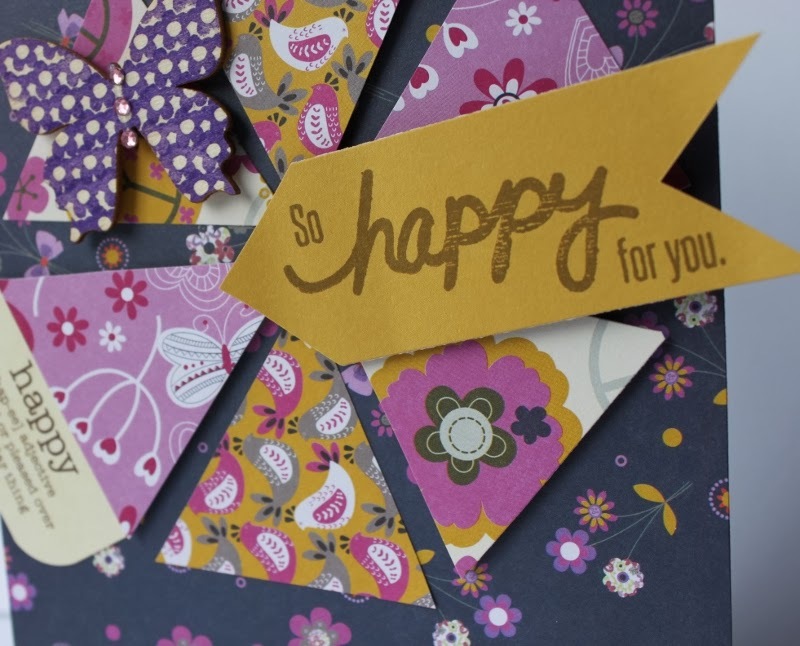 Using the mustard color cardstock page stamp the “So Happy For You” sentiment from the Handwritten Sentiments stamp set in brown ink and cut out in chevron arrow shape. 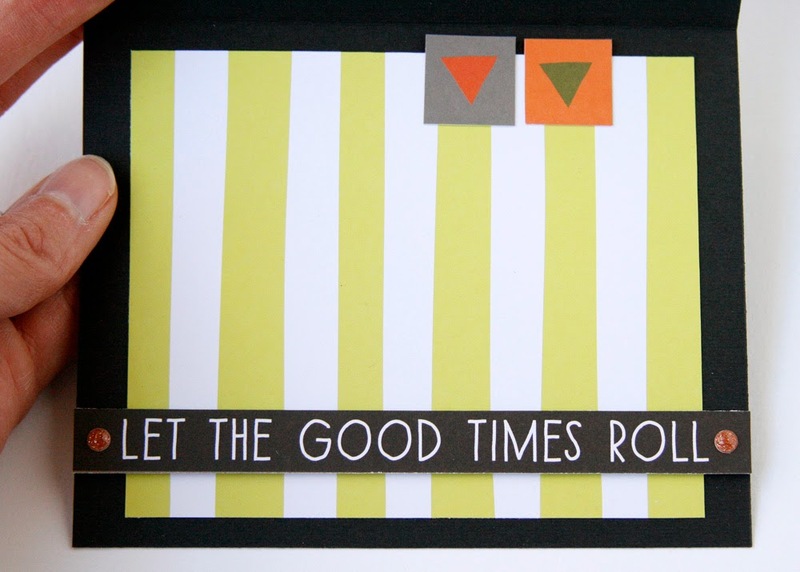 Attach sentiment to your card using the new Hampton Art Action Wobble Spring for extra added fun. 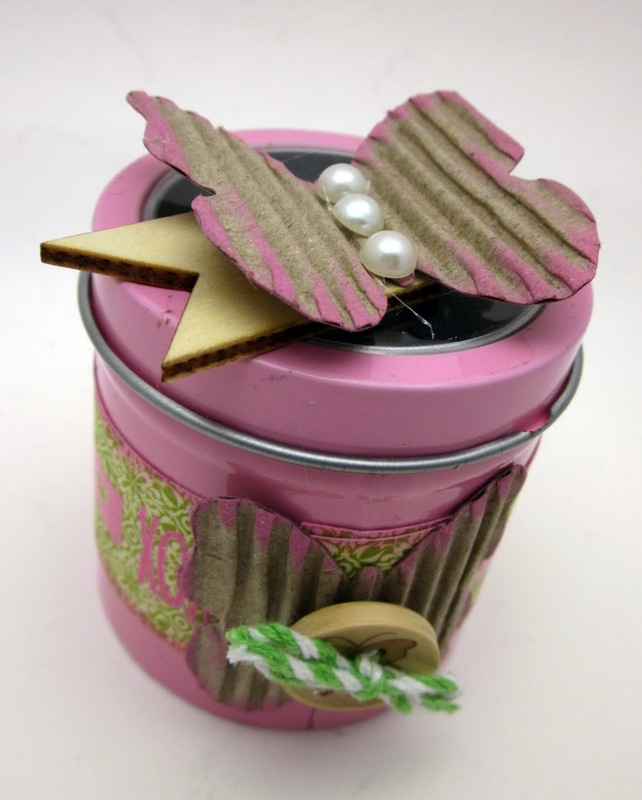 Then attach your wooden butterfly with glue dots as shown adding some bling down the center for emphasis. 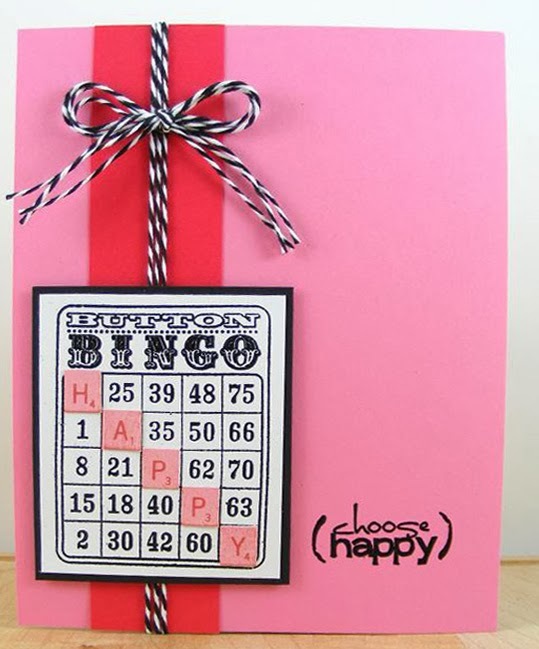 There it is a fun “happy for anyone” card utilizing the popular pie chart trend and triangle craze. We have an adorable little treat box to share with you. 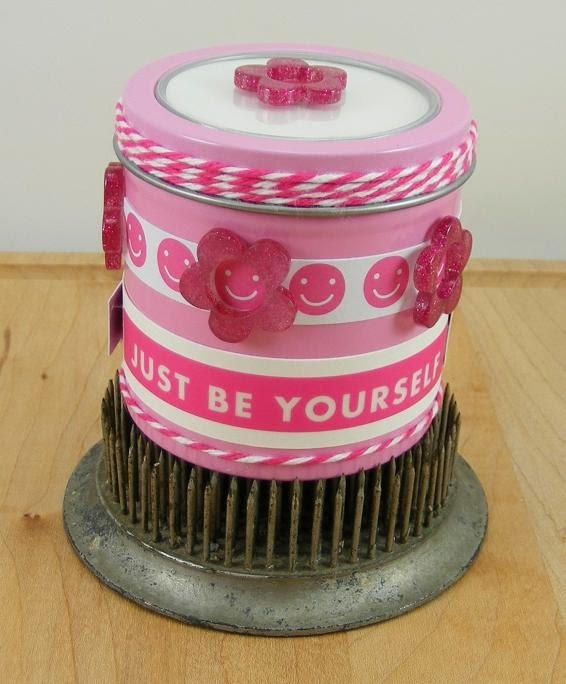 It was created from a Jillibean Soup Stampables kraft pillow box and the brand new “ You’re Tweet” stamp set. 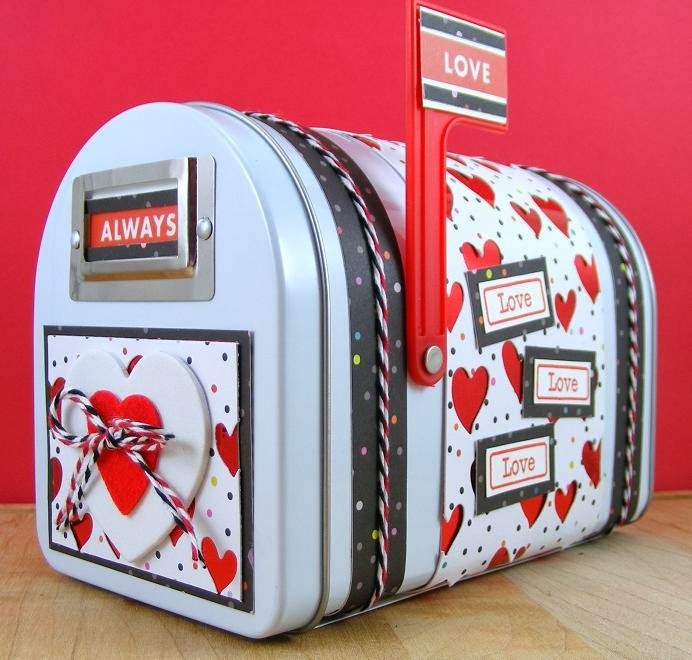 To stamp the box portion just leave the box flat and use the “You’re Tweet” stamp set heart word bubble stamp with brown ink and stamp on both sides as shown. Then using the KI Memories Autumn Flowers 6 x 6 paper pad find the tan cardstock and stamp the owl in brown ink. 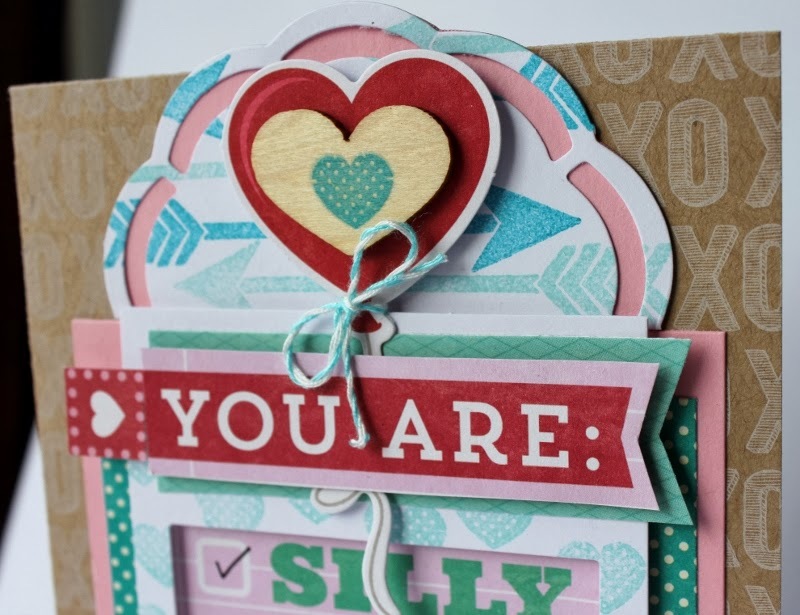 Next stamp the sentiment word bubble onto the coral color cardstock paper in brown ink and set aside. 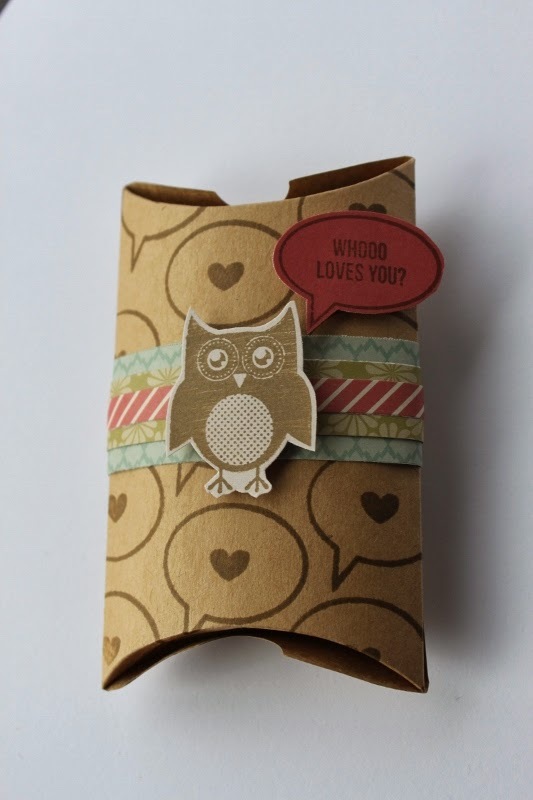 Now you just need to select three coordinating patterned paper strips to attach and wrap around the box after you fold it up and fill it with some wonderful treats. 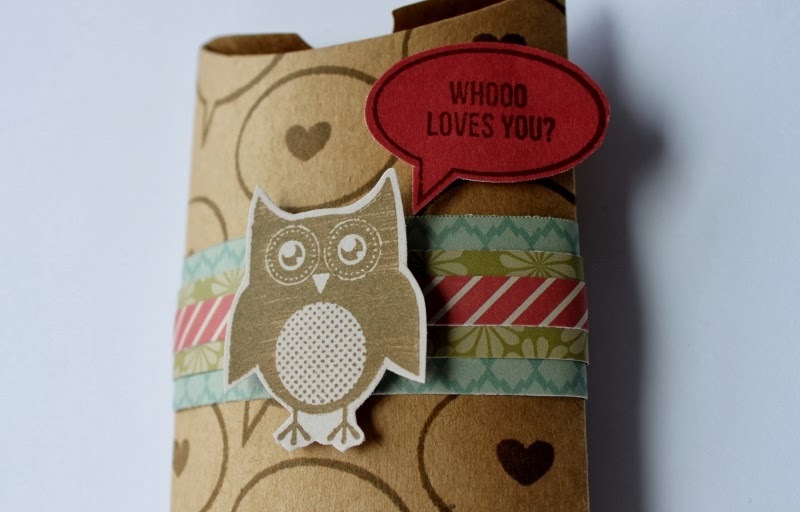 After the strips are added then attach the owl and word bubble sentiment with 3D foam dots. Now you only need to identify whooo you want to share it with. 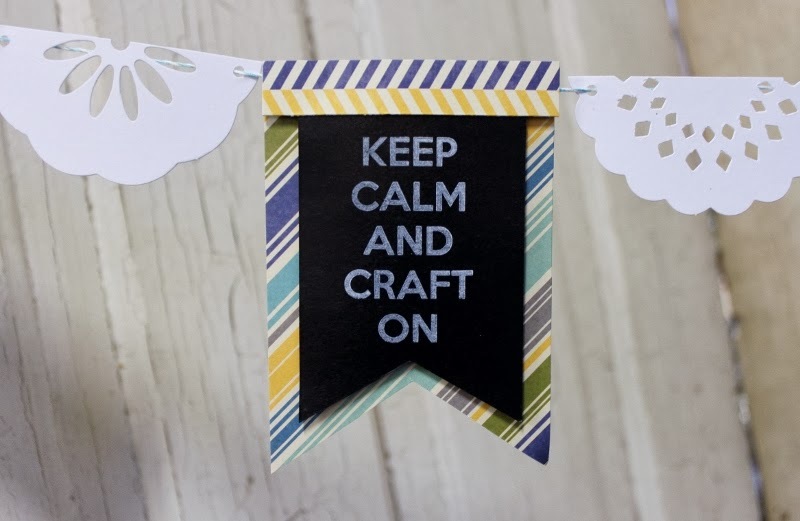 Do you need a fun décor element to add to your craft room this new year? Here is an easy one made with Hampton Art LOL Craft stamps and Jillibean Soup Cold Avocado papers. Set flags aside to dry for 24 hours. Using the Cold Avocado papers make the mats for the pennants and attach to chalkboard flags with 3D foam dots. Using a hold punch, punch the two top corners for the twine to feed through to hang. Then cut the top border strips from the same papers and attach with 3D foam dots. 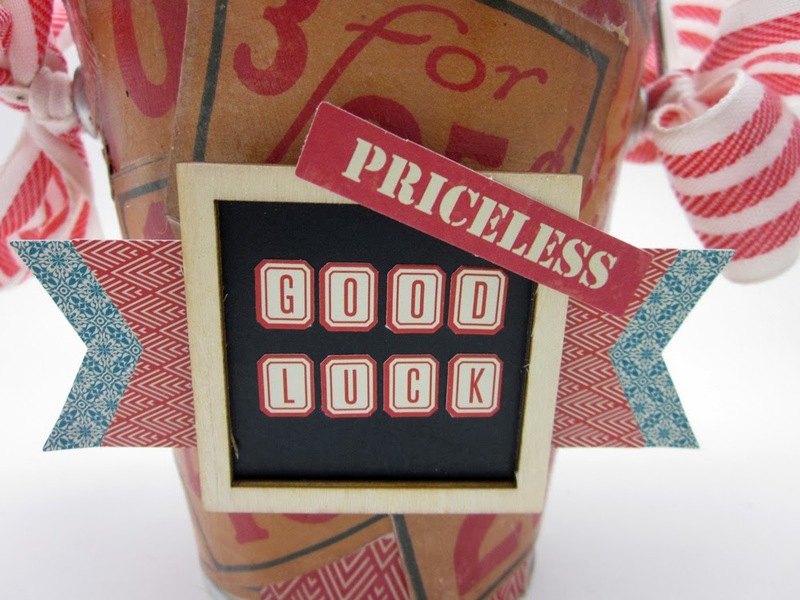 Select three doilies from the stampables pack and cut them in half. Hole punch the ends of each doily as shown for twine to feed through. Finally you just put it all together with your choice of bakers twine, alternating doilies with flags all the way across. Hang up and enjoy! 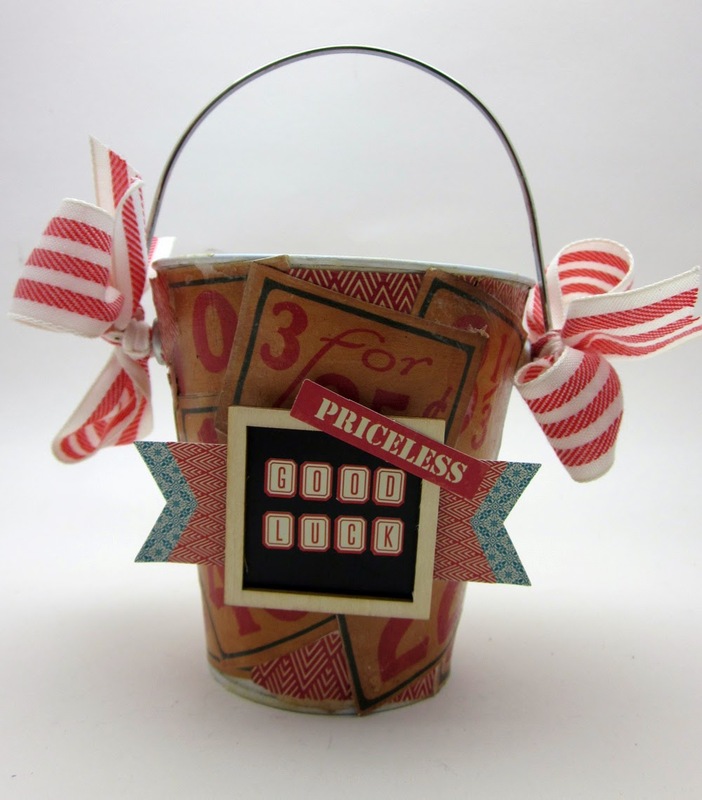 There you have it, a quick and easy décor project for that special crafting area in your home. Designer Notes: Fussy cut large flowers from the 12" x 12" patterned paper and layer with the stamped flower images (Bella Blvd | Sand n Surf) which have been stamped onto white cardstock. The black ink on white card, allows the eye to rest against the busy patterned paper design of the KI Memories Color Crush. 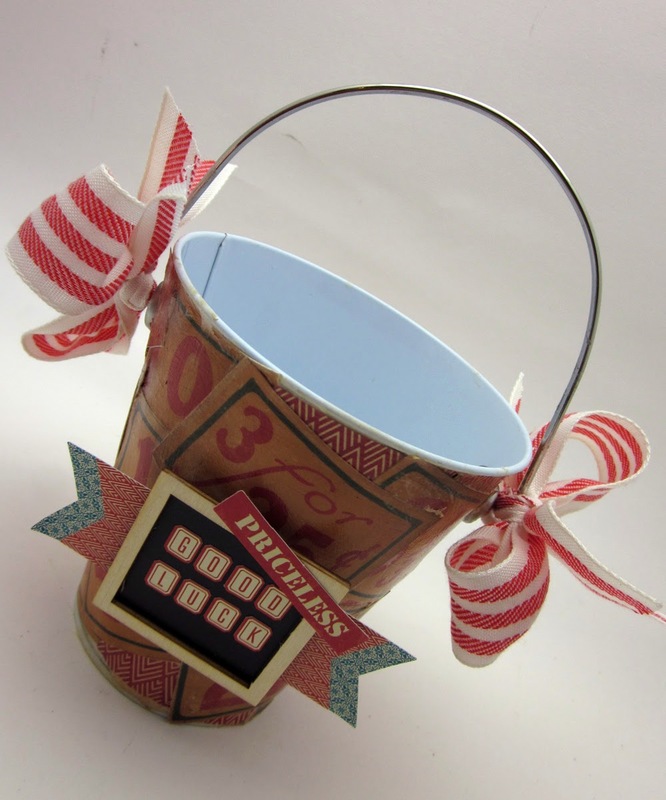 other: white cardstock, machine stitching, foam tape, small bow die. Hampton released a few new stamp sets with a great sense of humor - LOL stamps. Design Team member Dana Warren created quite a few cards for CHA using these stamps. Enjoy! Embellishments: My Mind’s Eye – Enamel dots from various collections. 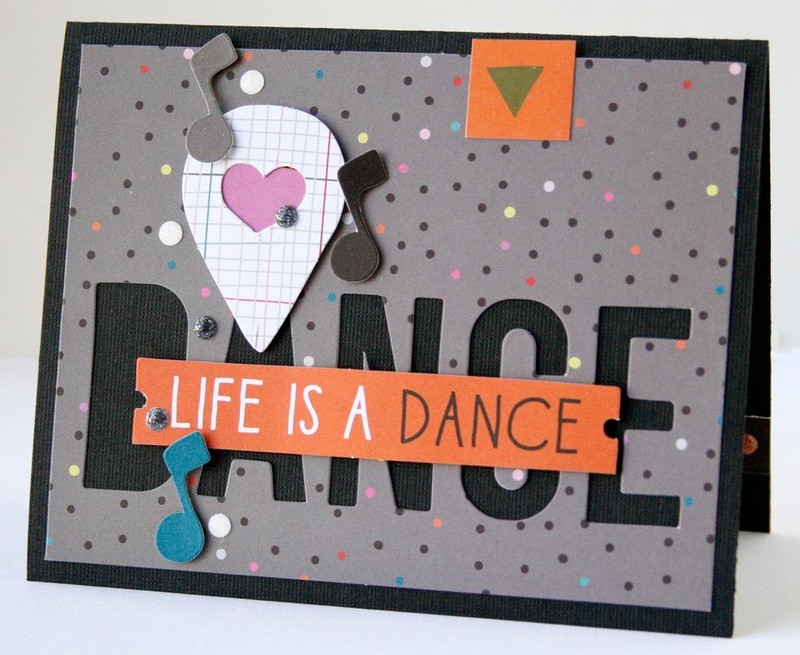 SVG Files, from Silhouette online store: A2 Lori Whitlock Card & Envelope Box. Sarah Bailey – Open Bar. 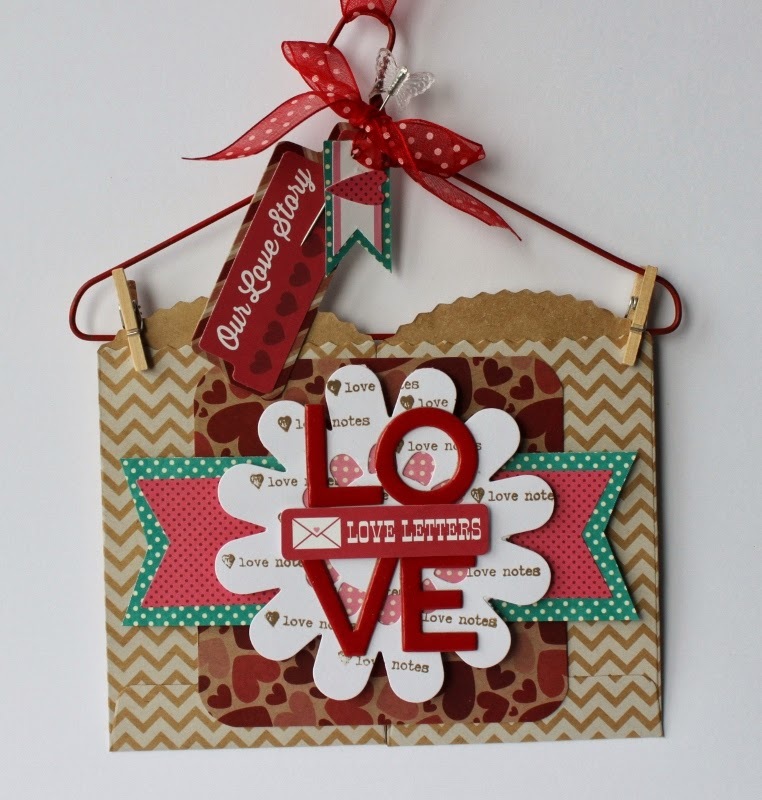 Embellishments: Jillibean – Large Wood Shape Assortment. Recollections – Fall Brads. Darice – Hemp. Ink: Tim Holtz Distress Ink – Frayed Burlap. Patterned Paper: Spicy Social Soup/1 part app, 4 parts hashtags, taste of texts, blanched bags, bite sized bits; Fresh vegetable Soup/chicken base. other - white gel pen, white mist, machine stitching, paper clip. 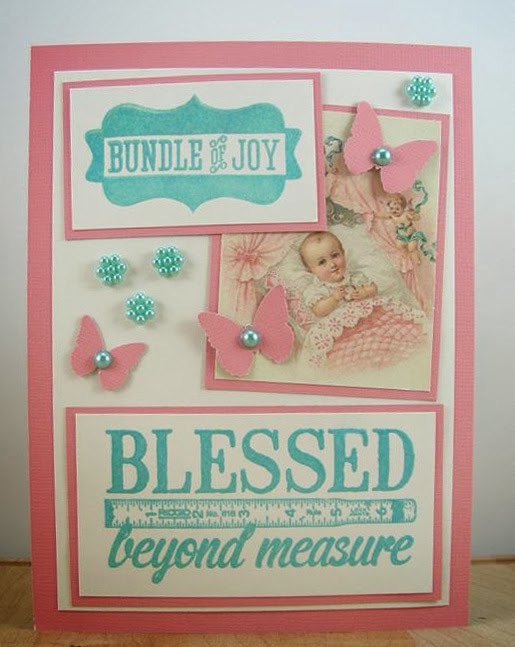 each and mount on coral pink cardstock. 4. Adhere three punched butterflies to card. flowers to base as shown. 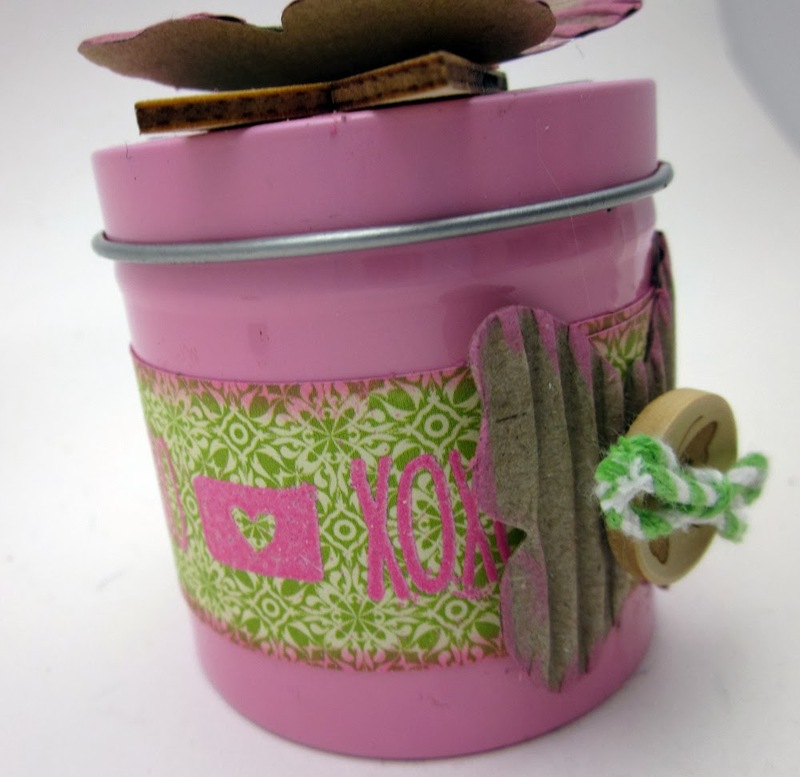 twine down red cardstock. Secure bow at top. in lower right corner of base. embossing powder. Trim and mount on black cardstock. to lower left of card base. as shown. Trim each and adhere to base. using red ink pad. Trim white middle section and adhere to red butterfly. 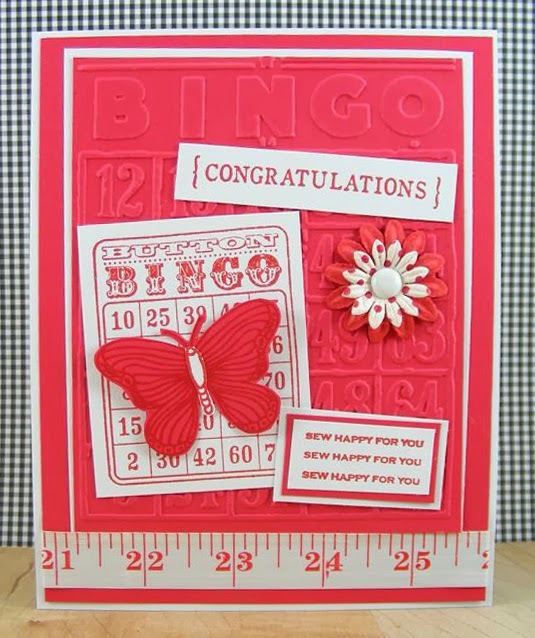 Adhere butterfly to Bingo image. 4. Secure flowers to card base with white brad. 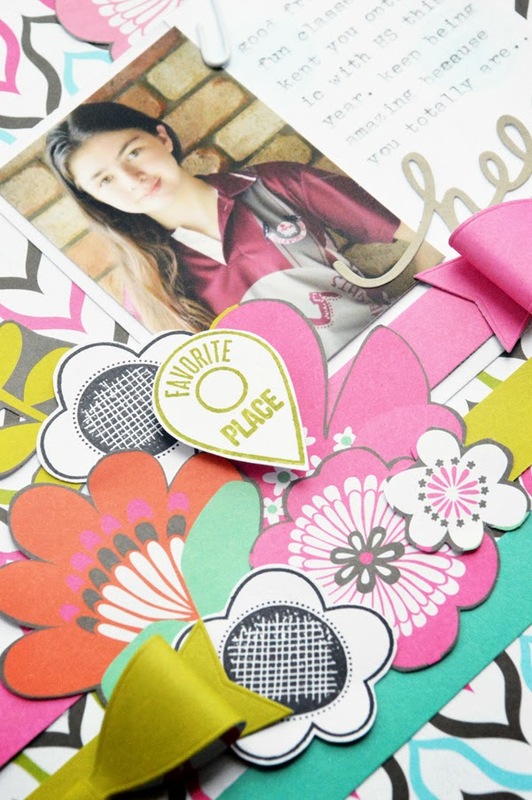 Designer Notes: Make a sweet little card for a teenager with bright colours and the gorgeous KI Memories Color Crush collection. The number '13' stamp image from Jillibean Soup | Irish Farm House Soup, is perfect. When stamping, mask the 'c' to prevent it from showing next to the number 13.
other: white cardstock, foam tape, small bow die. 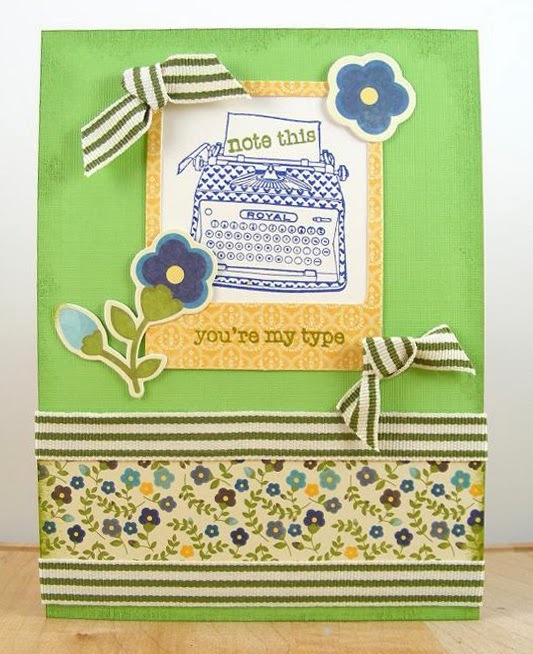 Designer Notes: Layer the selected patterned papers and choose two main contrasting colors for your ink. Cut a small doily from vellum and stamp with the large flower from the Jillibean Soup | Cold Avocado Soup in the centre. 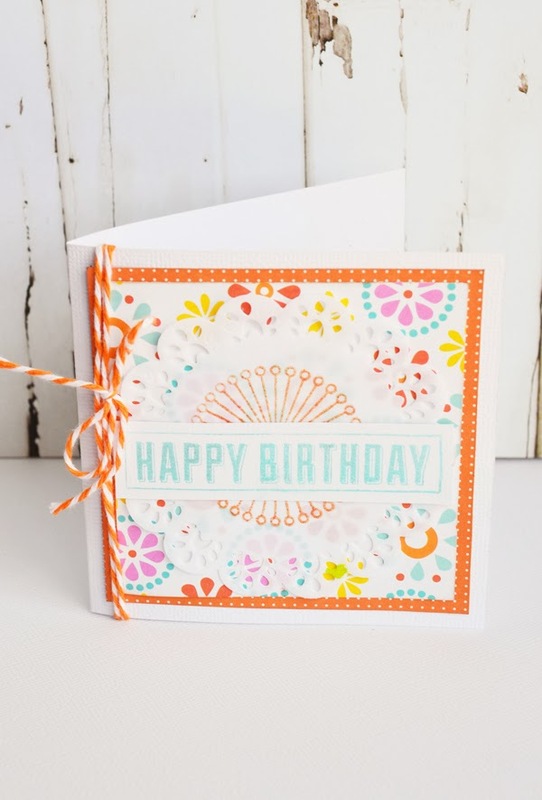 Layer the doily with the card sentiment "Happy Birthday", which has been stamped onto white cardstock and trimmed around the outside edge. 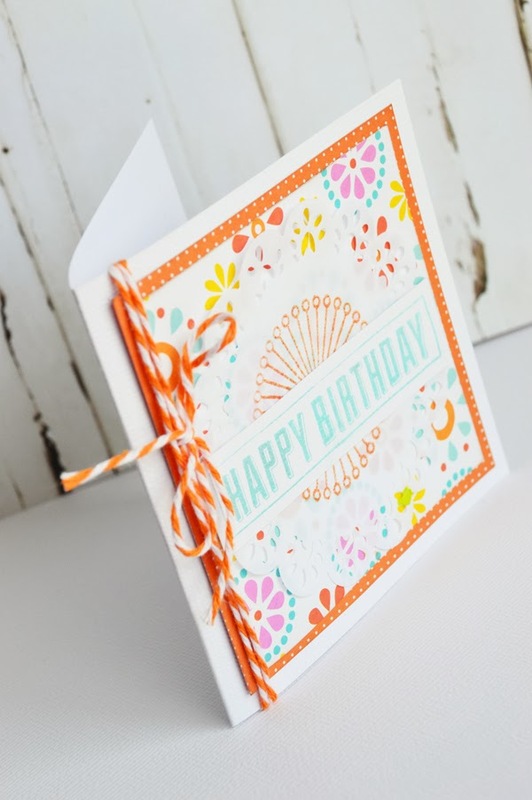 Finish the card by wrapping some twine close to the card's fold. stamps: Jillibean Soup |Cold Avocado Soup (jb00128); Echo Park | Scoot(sc0528). other: white cardstock, foam tape, small doily die, vellum. Designer Notes: To replicate the chalkboard look, stamp your image with white ink onto black paper. Trim around the outside edges of the image and mount onto white cardstock to create a frame/border. 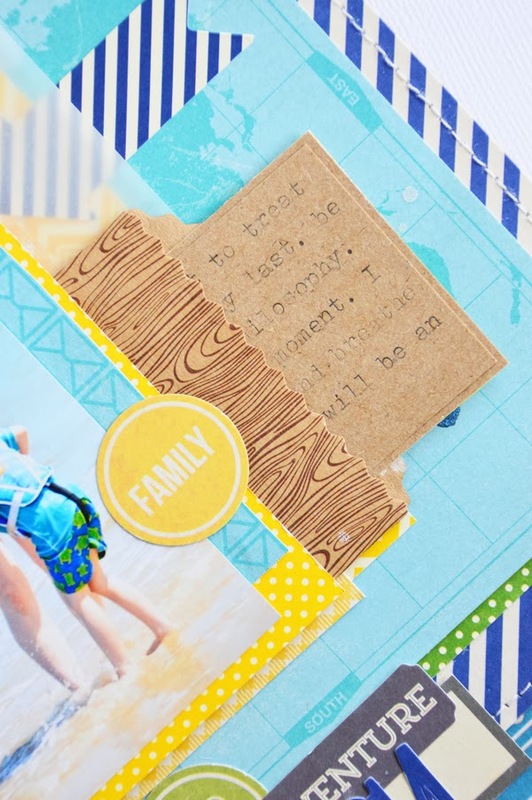 Add extra layers to your card by fussy cutting other images from the same collection. of base. 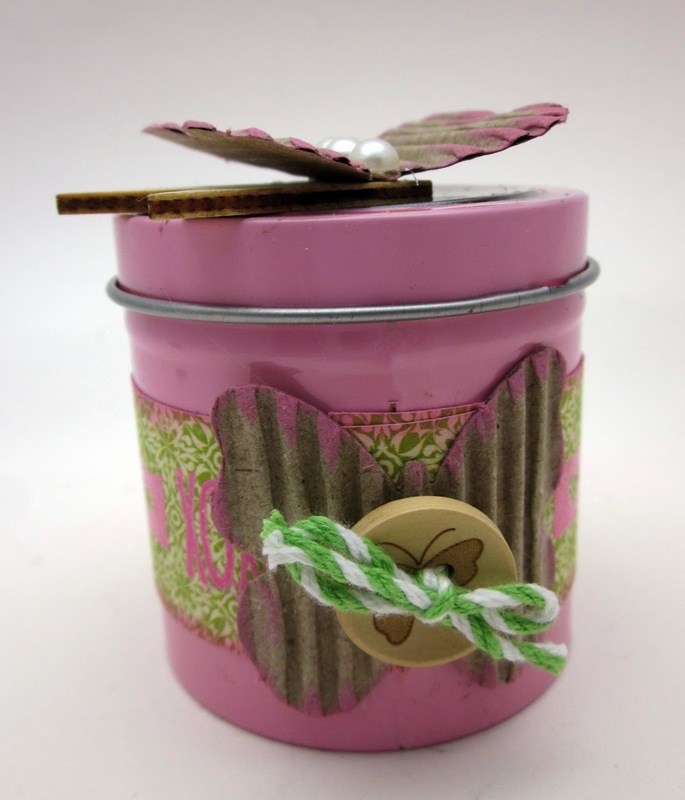 Secure striped ribbon above and below floral paper. 2. Stamp typewriter image with Nautical ink pad on ivory cardstock. bottom of frame. Adhere to upper center of card base. 3. Adhere flower diecuts to upper right and lower left of diecut frame. 4. 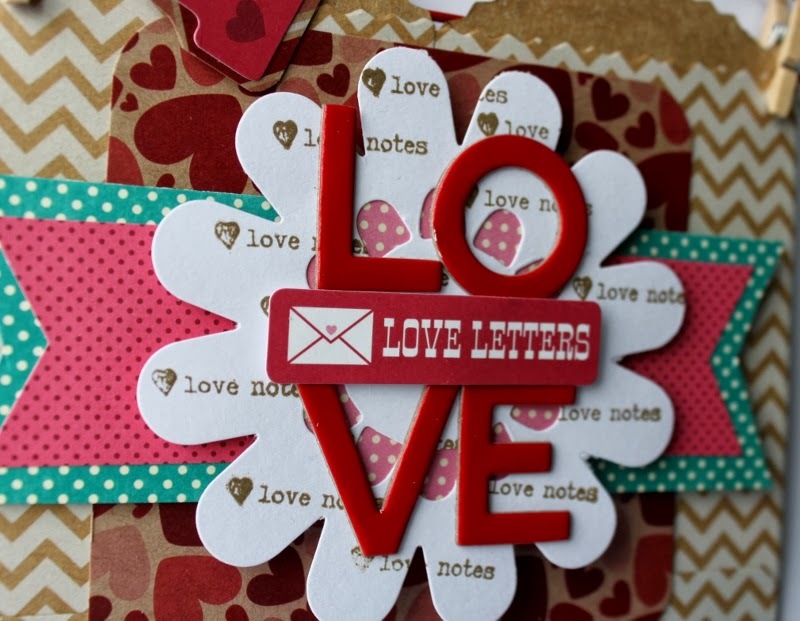 Secure knotted ribbons to upper left and bottom right of diecut frame. 1. Trim ivory cardstock and mount on yellow cardstock for card base. Adhere trimmed light bulb patterned paper to top and bottom of base. Color with yellow marker every other light bulb on patterned paper. 2. Stamp light bulb image with Nautical ink pad on ivory cardstock. Stamp sentiment below image. Trim and mount on yellow cardstock. 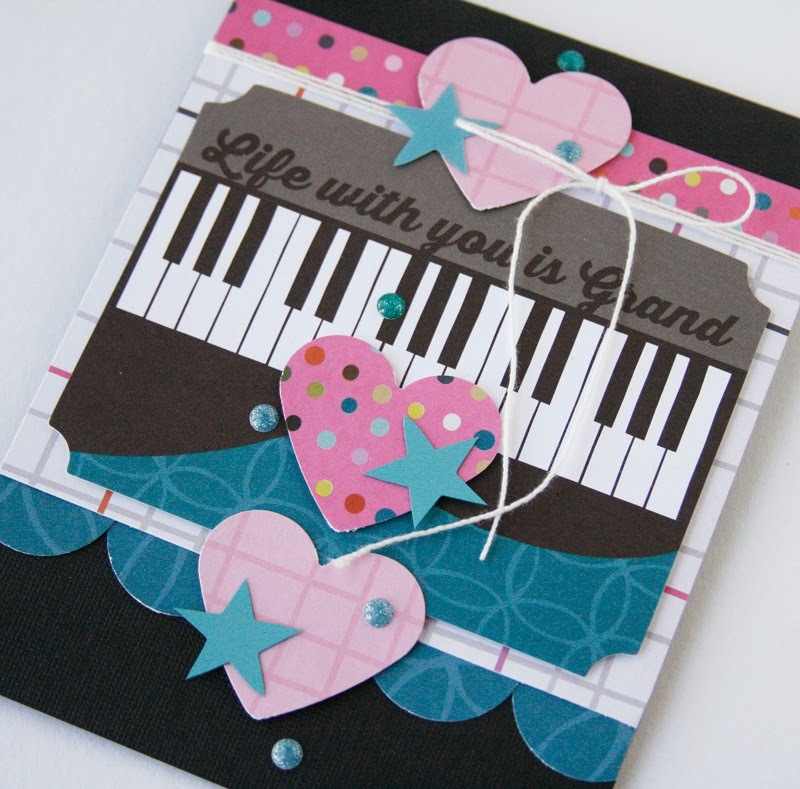 Adhere to center of card with foam tape. 3. 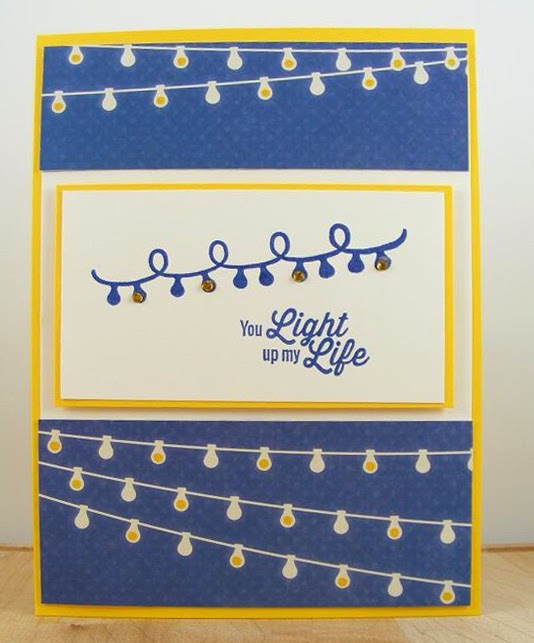 Adhere small yellow jewels to stamped light bulbs as shown.